The controversial trial of Theodore Wafer, the Dearborn Heights, Mich., man charged with manslaughter and second-degree murder in the fatal shooting of unarmed black teen Renisha McBride, continued in Michigan Wednesday, with the defense taking the forefront on Day 5 of the trial as the prosecution rested its case, the Detroit Free Press reports. Calling former Chief Wayne County Medical Examiner Dr. Werner Spitz to the stand, the defense on Wednesday inquired about McBride’s blood alcohol level along with other points of evidence gathered, the news site reports. A toxicology report indicated that McBride’s blood alcohol level was about 0.22 percent (three times above the legal limit in the state), but that was more than three hours after she had crashed her vehicle into a parked car, meaning that initially her blood alcohol level was most likely closer to 0.30 percent. That, Spitz noted, according to the Free Press, would mean that she would have had to have drunk at least 15 bottles of beer or a pint of vodka. A friend had told the courtroom in earlier testimony that she and McBride had been drinking vodka and smoking marijuana on that fateful night before the accident, which eventually resulted in McBride being shot dead on Wafer’s front porch. Assistant Wayne County Medical Examiner Dr. Kiliak Kesha, who performed McBride’s autopsy, had testified when called upon by the prosecution in the morning, that there were no visible injuries to McBride’s hands. The defense has been arguing that Wafer acted in self-defense, thinking that McBride was trying to break into his home. 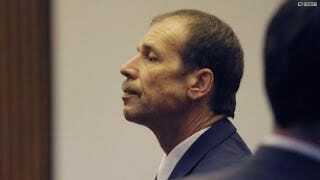 Wafer said that the teen had been banging on his doors in the morning hours of the November 2013 night, in a way that left him feeling disoriented, thinking there were more than one person out to get him. According to the Free Press, a photo from the scene showed that there was blood on the teen’s left hand. Kesha said the blood did not come from her hand. However, Spitz later countered, saying that the teen’s hands looked swollen, perhaps from pounding on the door. The defense also had the chance to question police Detective Sgt. Stephen Gurka, who led the case. According to the Free Press, defense attorney Cheryl Carpenter asked Gurka about what looked like a footprint on the air conditioner unit attached to Wafer’s home. “Maybe there was a second person trying to gain entry in the back of the house,” Carpenter suggested, asking if the investigator had considered that angle. “Then that’s the person Mr. Wafer should have shot,” Gurka said, according to the news site.